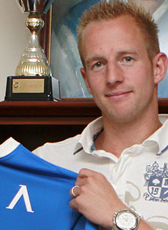 Sjoerd Ars signed a 3-year contract abroad at the end of June 2011. He moved to Bulgarian giants Levski Sofia. In mid-season 2011-12 transfermarket Ars made a loan move to Chinese club FC Tianjin Teda for the rest of the 2012 season. Ars played a successful season in China scoring 13 goals in 29 matches. In the winterbreak Ars went on trial at NAC Breda but failed to get a contract. He returned to his club in Bulgaria looking for new opportunities. In the second half of the 2012-13 season, Ars was send on loan at Turkish club Konyaspor. He made a big impression at the club but returned to Bulgaria at the end of the season awaiting his final contract year. In July 2013 he moved on a permanent deal to Turkey signing on a 2-year deal at second tier outfit Karsiyaka SK. In July 2014 he returned home signing a 2-year deal at just relegated NEC Nijmegen. NEC won the title in the second division in the 2014-15 season and Ars won the topscorer title scoring 28 goals. In August 2015 Ars signed a two-year contract at NAC Breda, the club that was just relegated. One year later, after a good season at NAC Breda scoring 21 goals, Ars signed a two-year contract at Szombathelyi Haladás in Hungary. In winter 2016-17, his contract was terminated and he returned home to sign for the rest of the season at Fortuna Sittard. For the 2017-18 season, Ars was on loan from Sittard to his former club de Graafschap. After expiration of his contract, Ars went to play for the Treffers in the second division (third tier). In December 2018 he hanged up his boots and retired from (semi-)professional football after a long career with experience in several foreign leagues. Ars was all-time top scorer of the Dutch Eerste Divisie (second tier), scoring 133 goals. He played his most matches for RBC Roosendaal.